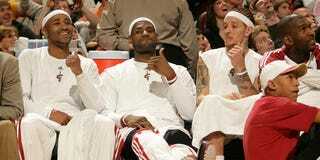 Was there any truth to the rumor that Delonte West and LeBron's mom, uh, you know? Two Cleveland insiders disagree on what happened, but no matter what, there's only one way for the Cavs to handle it. I spoke with two folks whose opinions I value, straight shooters with more experience and insight regarding the Cavs than I can claim. One told me that he's smelled enough smoke around the Delonte West-Gloria James story to believe that there's a fire in there somewhere; the other guy doesn't buy it, but does say that the Cavs will look to shop Delonte this off-season. Meet Mo Williams: Face of the Cleveland Cavaliers? Mo Williams, via Twitter: "I think I will watch the finals. It will be good for me. It can't do nothing but help, cause it hurt everytime I see a highlight." Mo was a late second-round draft pick in 2003, taken by the Utah Jazz after two years playing college ball at Alabama. The Cavs got him in a three-team deal in 2008, in yet another attempt to find a guy who could take some of the scoring pressure off LeBron. He made the All-Star team in 2009, as an alternate — Chris Bosh, Ray Allen, and Jameer Nelson were injured. Thing is, I like Mo Williams. He's a sweet-faced kid from Jackson, Miss., quick to smile, who fancies himself a snazzy dresser and anointed himself Mo Gotti in naive tribute to a Ravenite Social Club gutter ethos that wouldn't piss on him were he on fire. But Mo's not a wartime consigliere. What he is, though, is the face of the Cleveland Cavaliers if LeBron James leaves. So please watch the Finals, Mo. Please. And keep a close eye on Derek Fisher, who plays for the Lakers. He's much older, and even shorter and slower than you, but he doesn't play scared. You do. Who Is the Sexiest Woman Alive? Vote Now.